Kay Ahmed from Bolton is lucky to be alive. Kay was involved as a passenger in a car accident back in 2002 when he was just twenty. A blow out on a quiet road at 2am meant the car he was in was thrown from the road and despite immediate attention from a passing ambulance he ended up losing his sight. Kay now helps out where he can in the family business, Bolton based Autoworld, owned by Yacoob Ahmed. As someone who is registered blind, Kay has not been able to drive since the accident, despite being involved in the family motor business for over fifteen years. Prior to the accident Kay was a confident driver and loved motor sport. Since the accident, Kay has been left unable to indulge in his passion for motor sport and as there was no opportunity for him to experience this it was destined to remain just a memory. When Ian Bold, Sales Director at Aqueous Digital met Kay and he realised that there could be an opportunity to introduce him to his friend John Galloway at Speed of Sight. After working closely with Kay for a number of months he put together a plan to make Kay’s dreams become a reality. When Ian introduced Autoworld to Speed of Sight, the result was a track day experience Kay will never forget. Speed of Sight are a charity that helps blind, partially sighted and disabled children and adults to experience the thrill of driving cars on a racetrack. Run by John Galloway, the charity has been helping blind, partially sighted and disabled people to experience the thrill of motor sport since 2012. Autoworld Online is a highly successful car parts and accessories business based in Tonge Moor, Bolton. 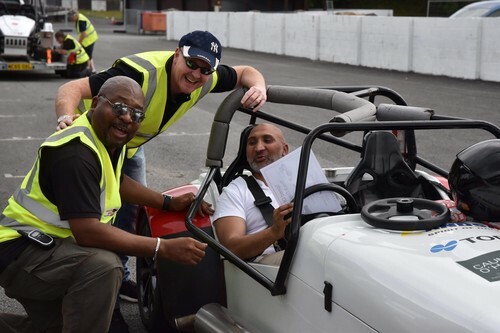 Speed of Sight are a charity that hosts driving days for disabled adults and children, their families and friends, inspiring self-confidence, social interaction, physical and mental wellbeing throughout the UK. Aqueous Digital are an award winning Digital Marketing Agency specialising in paid and organic search. This press release was distributed by ResponseSource Press Release Wire on behalf of Aqueous Consulting in the following categories: Motoring, Media & Marketing, Public Sector, Third Sector & Legal, for more information visit https://pressreleasewire.responsesource.com/about. Simple. Clear. Digital. Innovative Digital Marketing Solutions.